After our final night in the villa we awoke, finished packing, and walked up the road to the bus stop. We had time before the bus was due to arrive so we entered the nearby restaurant to have lunch, where we bumped into three of our villa-mates. They had left the villa earlier in the week but returned to the area on this day to have one last lunch at the restaurant and say goodbye to the waitress they had befriended. We were very fortunate to have run into them because our bus arrived early and never stopped. We exited the restaurant just in time to see it speeding down the hill. If our villa-mates had not been there we would have been screwed. The next bus wasn’t coming anytime soon and we would definitely have missed our train to Basel. Luckily, they had a car and were able to drive us down the hill and into Florence, all the way to the train station. We arrived in Basel late that afternoon. Uncle Kipp’s friend Andy met us at the train station and guided us via public transportation back to her apartment. We would be spending the next three nights here before heading to Croatia. At the apartment we met the rest of her family, including her mother, who cooked us a delicious Tex-Mex dinner. Before dinner I had my first ever glass of Prosecco—and a love affair was born that continues to this day. It’s so inexpensive over there that Andy had an entire fridge stocked with it. After dinner I tried my first roasted chestnut, which was a big deal for me because I don’t like any kind of nuts in general, but I was able to enjoy these. Before bed that night I skyped with my wife, Jen. I had chatted with her on the phone throughout the first 16 days of the trip, and of course I missed her the whole time, but it wasn’t until seeing her and my dog, Heidi, on video that I truly began feeling homesick—and I still had two weeks to go. We had been apart for 8 to 9 days on my previous trips, but a month is a long time. For the most part I was okay because I was always so busy during the day, but at night it would catch up with me a bit. After breakfast the next morning we went for a walk all over the city. 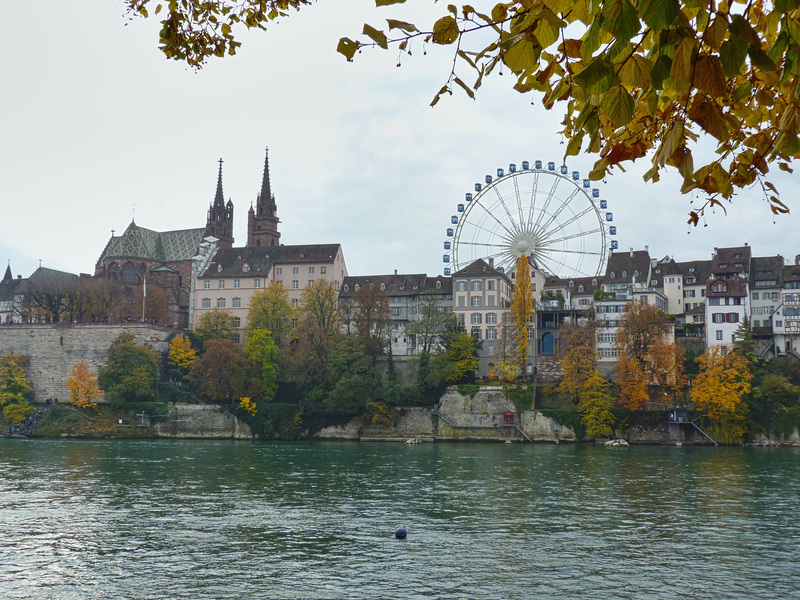 Unlike Lucerne, Basel is not nestled in the Alps, but it still has plenty of its own charm, and the Rhine is never far away. There was a fall festival going on that reminded me of the carnivals we have in the States. While walking though the festival we rode the large Ferris wheel, which provided us with spectacular views of the city when we reached the top. After lunch we went to a mall, which was near a McDonald’s. I was very tempted to get my Pulp Fiction on and go order a “Royale with Cheese.” Anyway, that night I skyped with Jen again before bed. It was Halloween, but they don’t really seem to celebrate it in Switzerland, so it was basically just a normal night.